The production of digestive acids can have many different influences including age, stress, disease, physical condition and allergies. 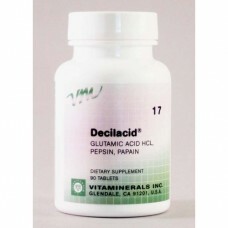 Vitamineral's Decelacid helps the digestive process which begins with the action of stomach acids on ingested foods, transforming and reacting them into bioavailable, absorbable nutrients. It is important to note that the symptoms for hypoacidity are virtually the same as hyperacidity and is often misdiagnosed. In addition to gastric distress hypoacidity, a deficiency in acid content, results in decreases in nutrient absorption, especially minerals such as calcium and magnesium.